The aim of the qualification is to train psychologist professionals who master the theories and methods of the science of psychology at an advanced level, who are proficient in the various fields of psychology, who possess the skills and techniques of the psychologist profession and are able to apply these to help individuals, groups or organizations develop and improve. Further aims are to present recent theoretical and practical material, to establish professional skills and commitment for the profession within the field of psychology at a level that gives a solid foundation of knowledge that enables the student to practice psychology as a vocation independently at a master level, to participate in postgraduate courses and to attend further training in doctoral schools. A master of psychology is characterized by expansive and integrated professional and theoretical knowledge, the creative adaptation of the methods of academic knowledge, psychological responsiveness and communicational efficacy through the utilization of personal resources along with a high degree of professional commitment. 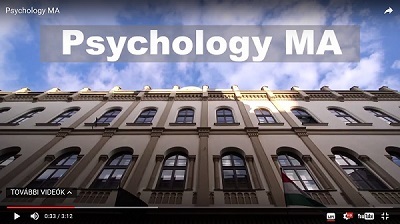 The Institute of Psychology of the Faculty of Education and Psychology, Eötvös Loránd University is situated in the heart of Budapest and is one of the main institutions of Hungarian psychological education and research. Students can learn in English as well as in Hungarian on both BA, MA and PhD educational levels. The number of our lecturers exceeds 100 and we maintain good professional relations with more than 50 organizations which offer internship possibilities to our students. We lay special emphasis on research and development projects, where international cooperation and the collaboration of our students are both priorities.